ଆଫ୍ରିକୀୟ ଜଙ୍ଗଲି କୁକୁର (Lycaon pictus). ରୁଡ୍ୟାର୍ଡ୍ କିପ୍ଲିଂଗଙ୍କ ଲିଖିତ "ଦ ଜଙ୍ଗଲ ବୁକ୍" ଗଳ୍ପରେ ଖଳନାୟକ ଶେର୍ ଖାନ୍‍ର ସାଥୀ ହେଉଛି "ତବାକି" ନାମକ ଏକ ଭୀରୁ ସୁବର୍ଣ୍ଣ ଶୃଗାଳ । ଶିକାରୀ ଓ ଲେଖକ କେନ୍ନେଥ୍ ଆଣ୍ଡର୍ସନ୍ ନିଜ ଗଳ୍ପ "The Call of the Man-eater” (ନରଖାଦକର ଡାକ)ରେ ଏକ ଏକାକୀ ବିଲୁଆ ଓ ନରଖାଦକ ମହାବଳ ବାଘ ମଧ୍ୟରେ ରହିଥିବା ଅଦ୍ଭୁତ ଯୁଗଳବନ୍ଦୀ ବିଷୟରେ ଉଲ୍ଲେଖ କରିଛନ୍ତି ।. ଭାରତ ଓ ପାକିସ୍ତାନର ବିଭିନ୍ନ ପ୍ରସିଦ୍ଧ ଉକ୍ତି ଓ ଋଢ଼ିରେ ବିଲୁଆର ଉଲ୍ଲେଖ ରହିଛି । ଯଥା ଟିପୁ ସୁଲତାନ୍ କହିଥିବା "ଶହେ ବର୍ଷ ବିଲୁଆପରି ବଞ୍ଚିବା ଅପେକ୍ଷା ଗୋଟିଏ ଦିନ ସିଂହପରି ବଞ୍ଚିବା ଶ୍ରେୟସ୍କର ।"
↑ Coyote (2004) by E.M. Gese & M. Bekoff Archived 2011-01-04 at the Wayback Machine. ↑ "jackal". The American Heritage Dictionary of the English Language. ↑ ୪.୦ ୪.୧ Lindblad-Toh, K.; Wade, C. M.; Mikkelsen, T. S.; Karlsson, E. K.; Jaffe, D. B.; Kamal, M.; Clamp, M.; Chang, J. L.; Kulbokas, E. J.; Zody, M. C.; Mauceli, E.; Xie, X.; Breen, M.; Wayne, R. K.; Ostrander, E. A.; Ponting, C. P.; Galibert, F.; Smith, D. R.; Dejong, P. J.; Kirkness, E.; Alvarez, P.; Biagi, T.; Brockman, W.; Butler, J.; Chin, C. W.; Cook, A.; Cuff, J.; Daly, M. J.; Decaprio, D.; et al. (2005). "Genome sequence, comparative analysis and haplotype structure of the domestic dog". Nature. 438 (7069): 803–819. Bibcode:2005Natur.438..803L. doi:10.1038/nature04338. PMID 16341006. ↑ ୫.୦ ୫.୧ Koepfli, K.-P.; Pollinger, J.; Godinho, R.; Robinson, J.; Lea, A.; Hendricks, S.; Schweizer, R. M.; Thalmann, O.; Silva, P.; Fan, Z.; Yurchenko, A. A.; Dobrynin, P.; Makunin, A.; Cahill, J. A.; Shapiro, B.; Álvares, F.; Brito, J. C.; Geffen, E.; Leonard, J. A.; Helgen, K. M.; Johnson, W. E.; O’Brien, S. J.; Van Valkenburgh, B.; Wayne, R. K. (2015-08-17). "Genome-wide Evidence Reveals that African and Eurasian Golden Jackals Are Distinct Species". Current Biology. 25 (16): 2158–65. doi:10.1016/j.cub.2015.06.060. PMID 26234211. ↑ ୬.୦ ୬.୧ Thos vs Canis Archived 2008-04-16 at the Wayback Machine. ↑ Wayne, R. (1993). "Molecular evolution of the dog family". Trends in Genetics. 9 (6): 218–24. doi:10.1016/0168-9525(93)90122-X. PMID 8337763. ↑ Wurster-Hill, D. H.; Centerwall, W. R. (1982). "The interrelationships of chromosome banding patterns in canids, mustelids, hyena, and felids". Cytogenetics and Cell Genetics. 34 (1–2): 178–192. doi:10.1159/000131806. PMID 7151489. ↑ Miklósi, Adam (2008). "4.2.1". Dog behaviour : evolution and cognition. Oxford: Oxford University Press. ISBN 9780199545667. Retrieved 27 May 2017. ↑ Dinets V. The Canis tangle: a systematics overview and taxonomic recommendations. Vavilovskii Zhurnal Genetiki i Selektsii – Vavilov Journal of Genetics and Breeding. 2015;19(3):286-291. ↑ "Side-Striped Jackal" (PDF). Canids.org. Archived from the original (PDF) on 2009-02-20. Retrieved 2010-03-19. ↑ Macdonald, David (1992). The Velvet Claw. p. 256. ISBN 978-0-563-20844-0. ↑ Estes, Richard (1992). 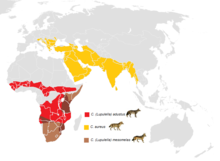 The behavior guide to African mammals: including hoofed mammals, carnivores, primates. University of California Press. ISBN 978-0-520-08085-0. ↑ Feddersen-Petersen, Dorit (2004). Hundepsychologie (in ଜର୍ମାନ) (4th ed.). Stuttgart: Franck-Kosmos-Verlag. ISBN 978-3-440-09780-9. ↑ Anderson, Kenneth. The Call of the Man-eater. p. 32, 36, 42. ISBN 978-81-716-7469-5. ↑ "Jackal", classic.net.bible.org; accessed 26 February 2015.